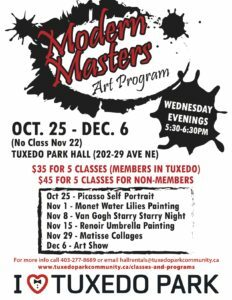 A different modern master painting class every week! Picasso Self Portrait: In this class we study about Picasso’s work in the area of cubism and his unique style of art. We show examples of his work, and go through step by step of how we create their own self portrait. Monet Water Lily Paintings: Kids discover Monet and the amazing art that he created, and we will replicate their version of one his most famous of pieces, using mixed medium and blending techniques. Van Gogh Starry Starry Night: Kids discover Van Gough and the amazing art that he created, and we will replicate their version of one his most famous of pieces using water colors and crayons. Renoir Umbrella Portraits: Kids discover Renoir’s ability to sue shades of coloring to create details of light versus shadow. Creating umbrellas with shading and highlighting using the same colors. Matisse Collages: Kids discover Matisse’s collages and combining different elements into one overall pictorial.